By 1917 the conflict we call The First World War had been raging for over two years, drawing in troops from Europe, Africa, Asia, North America, and Australasia, although the main battles were in Europe. The main belligerents were, on one side, the German and Austro-Hungarian Empires (the 'Central Powers') and, on the other, the British, French and Russian Empires (the 'Entente' or 'Allies'). The war had been expected to last just a few months in 1914, but the conflict had dragged on in a stalemate of trenches and massive death tolls, and all sides in the war were looking for any advantage they could gain. Sent through a supposedly secure channel devoted to peace negotiations (a transatlantic cable belonging to Scandinavia) on January 19th, 1917, the 'Zimmermann Telegram' – often called the Zimmermann Note — was a memo sent from the German Foreign Minister Arthur Zimmermann to the German Ambassador to Mexico. It informed the ambassador that Germany would be resuming its policy of Unrestricted Submarine Warfare (USW) and, crucially, ordered him to propose an alliance. If Mexico would join in a war against the US, they would be rewarded with financial support and re-conquered land in New Mexico, Texas, and Arizona. The ambassador was also to ask the Mexican President to propose his own alliance to Japan, a member of the Allies. 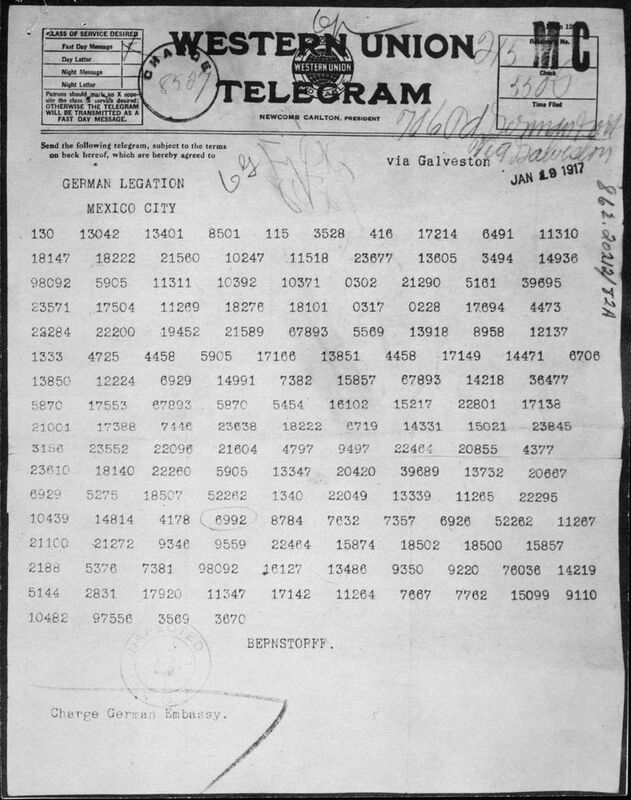 Why Did Germany Send the Zimmermann Telegram? Germany had already stopped and started USW — a program of sinking any shipping coming near their enemies in an attempt to starve them of food and materials — because of fierce US opposition. America's official neutrality involved trading with all belligerents, but in practice, this meant the Allies and their Atlantic coastlines rather than Germany, who suffered from a British blockade. Consequently, US shipping was frequently a victim. In practice, the US was giving the UK aid which had prolonged the war. The German high command knew renewed USW would probably cause the US to declare war on them, but they gambled on shutting Britain down before an American army could arrive in force. The alliance with Mexico and Japan, as proposed in the Zimmermann Telegram, was intended to create a new Pacific and Central American Front, greatly distracting the US and aiding the German war effort. Indeed, after USW resumed the US severed diplomatic relations with Germany and began debating an entry into the war. However, the 'secure' channel wasn't secure at all: British intelligence intercepted the telegram and, recognizing the effect it would have on US public opinion, released it to America on February 24th, 1917. Some accounts claim the US State Department was also illegally monitoring the channel; either way, US President Wilson saw the note on the 24th. It was released to the world press on March 1st. Mexico and Japan immediately denied having anything to do with the proposals (indeed, the Mexican President was content at a recent American withdrawal from his country and Germany could offer little beyond moral support), while Zimmermann admitted the Telegram's authenticity on March 3rd. It had often been asked why Zimmermann came right out and fully admitted things instead of pretending otherwise. Despite Germany's complaint that the Allies had been wiretapping secure peace networks, the US public — still concerned at Mexico's intentions following trouble between the two — was aghast. A vast majority reacted to both the Note, and weeks of growing anger at USW, by backing war against Germany. However, the note itself did not provoke the US into joining the war. Things might have stayed as they were, but then Germany made the mistake which cost them the war and restarted Unrestricted Submarine Warfare again. When the American Congress approved Wilson's decision to declare war on April 6th in reaction to this, there was just 1 vote against. "On the first of February, we intend to begin submarine warfare unrestricted. In spite of this, it is our intention to endeavor to keep neutral the United States of America. If this attempt is not successful, we propose an alliance on the following basis with Mexico: That we shall make war together and together make peace. We shall give general financial support, and it is understood that Mexico is to reconquer the lost territory in New Mexico, Texas, and Arizona. The details are left to you for settlement.